When the Atlanteans get territorial, they sink a nuclear submarine that enters their sovereign waters, bringing the Justice League rushing to the rescue. Once again, the Javelin is an excellent plot device: having submersible capabilities and breathing masks on-board to get the heroes where the action is. Note that Superman and Wonder Woman (by definition the strongest heroes around) strain to push the Atlantean warships into each other. This is an example of how Strength scales in the comics. Some versions of Superman juggle planets while the animated series version can catch a falling airliner (as in the initial arc of the Superman animated series) but strains to keep it from crashing. Deadshot ambushes Aquaman and critically wounds him, although not with a direct hit. This is largely a plot device, up to and including Aquaman’s survival. Since Aquaman is presumably a GM-controlled character in this story, and Deadshot certainly is, note that this scene did not need to involve any die-rolling or the like. The GM can just declare the outcome. Why did Deadshot not kill Aquaman outright (and what, for that matter, did he use a rocket launcher rather than a sniper rifle)? Who knows? 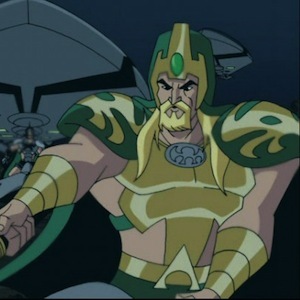 Maybe he over- or underestimated the Atlantean’s toughness. The energy discharge device Deadshot attaches to the manhole cover to aid his escape started off the joke that Superman’s vulnerability in Justice League wasn’t kryptonite, but electricity. Still, it’s an example of working around a seemingly insurmountable obstacle: Superman is (largely) invulnerable, but he still feels pain. If it isn’t possible to damage him, it may still be possible to hurt him, and at least delay him, as in this instance. In the chase, Deadshot manages to evade the League on several occasions before Superman (the first hero he thwarted) manages to stop him. Note that this fits into the Icons requirement that you have to fail at a task at least once before you can make a determined effort to succeed. Plot Devices: As several situations in this episode emphasize, it is worthwhile to have plot devices to gloss over what would otherwise be significant problems like “how do we get to the bottom of the ocean to rescue a sunken nuclear sub?” Just as in the previous episode, the League just takes their handy spaceplane/submarine, whether it’s flying off to a distant star system or deep beneath the sea. This suggests that it is the GM’s job, if you set up a particular situation, to at least provide a means for the characters to get there. It would be a pretty poor game, for example, if none of the heroes had aquatic capabilities and the GM offered the crisis of the sunken sub, but no means to get at it. Don’t Give the Rules Chances to Spoil Things: If you do not need to roll dice for Deadshot’s assassination attempt on Aquaman (for example), then don’t do it, unless you want an element of randomness there. Similarly, in Batman’s interrogation of Deadshot, he’s either going to get the information or he’s not, but it doesn’t seem like a situation where the GM wants things to turn on a poor die roll. Whenever the dice come out, there’s a chance for an unexpected result. If that’s not what you want, don’t chance it more than necessary. This is one of the reasons why many games provide guidelines for “routine” checks and when you should bother to roll the dice at all. Situational Benchmarks: The uses of Strength in this episode suggest it is probably better to treat abilities like Strength with situational benchmarks, rather than hard and fast measurements. After all, what’s more useful in game play terms: “Can lift a full jumbo jet and push a battleship with some effort” or “Can lift/press 200 tons”? This entry was posted in Re:Animated and tagged justiceleague, reanimated, rpg, superhero. Bookmark the permalink.